Welcome to STEPS (Students Teaching English Paper Strategies), a web site designed to help you write good papers about literature! While some literature web sites are constructed by teachers and professors, this site is constructed for students, by students. We know that writing papers about literature can be hard. Sometimes you may be so stressed that you don’t know where to begin. Sometimes you may not know what your teachers are even talking about when they say to write a literary analysis. Sometimes you may HATE the story you’re supposed to write about and despise reading in general. We get it. We’ve developed this site with those and many other student concerns in mind. We want to help you write a great literary analysis paper, an essay where you argue for how an author delivers a particular idea or message (most teachers call this a theme) using particular strategies (teachers often call these devices or elements—symbols, characters, metaphors, etc.). Writing about literature isn’t easy, and it will take time and hard work, but we’ve come up with a doable process that will help you write a successful essay. 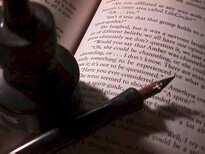 Writing a literary analysis essay is important; understanding this point will help you write a better paper. We believe the process of writing about literature will not only help you understand literature better, but it will help you understand yourself and important issues in the world better (things like love, death, racism, war, sexism, family, friendship, power). We believe that thinking about these issues will also make reading and writing about literature more enjoyable and maybe even fun - we’re geeky that way. But even if you’re not a geek, there are practical reasons why writing about literature will help you—you will develop critical thinking, communication, and interpersonal skills that will transfer to other classes and also jobs once you’re out of school. Finally, we should mention that we’ve created this site to be flexible. We have a process, but you don’t necessarily have to follow every step as we describe it—there may be parts you find helpful, and parts that you don’t. Let us know the parts that help and just ignore the parts that don’t and if you have any suggestions on what would make this site more helpful, please let us know. Good luck! Currently, we are in a beta-version of this site, so we'd love to hear feedback from you about the parts that are useful and suggestions for improvement.